The term “ephemera” refers to printed matter intended to be of use only a short time and then discarded. Examples of ephemera include theatre programs, restaurant menus, railway schedules, or even valentines. Although never meant to be seriously collected – as are books, manuscripts or prints – ephemera have long been recognized as invaluable documents for historical study. Perhaps one-quarter of the 8,000 titles in the Miner Library’s Atwater Collection of American Popular Medicine is comprised of ephemera, ranging from printed collections of receipts for home remedies, to lecture announcements, instruction on the use of contraceptives, illustrations of healthier fashions for women accustomed to be bound in stays and hoops, or patent medicine advertising. At the fair held in conjunction with the annual meeting of the Ephemera Society of America, recently held in Old Greenwich, Ct., we acquired 131 pieces of ephemera for the Atwater Collection. Three of these are single leaf circulars that advertise hair preparations. 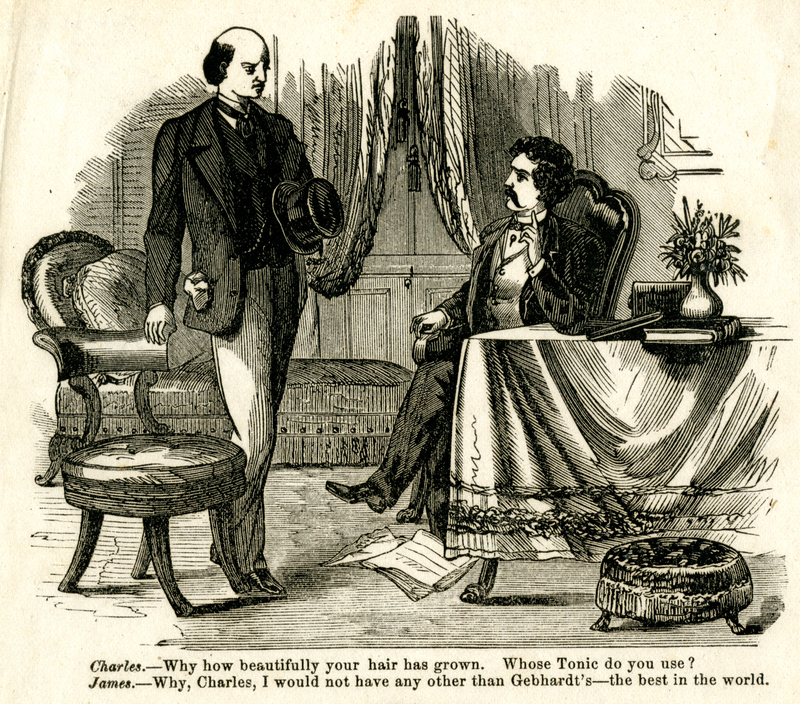 The “druggist and perfumer” J. Mahlon Lewis prepared Lewis’ Eglantine Excelsior in New Bedford, Ma., during the 1850s and 1860s. 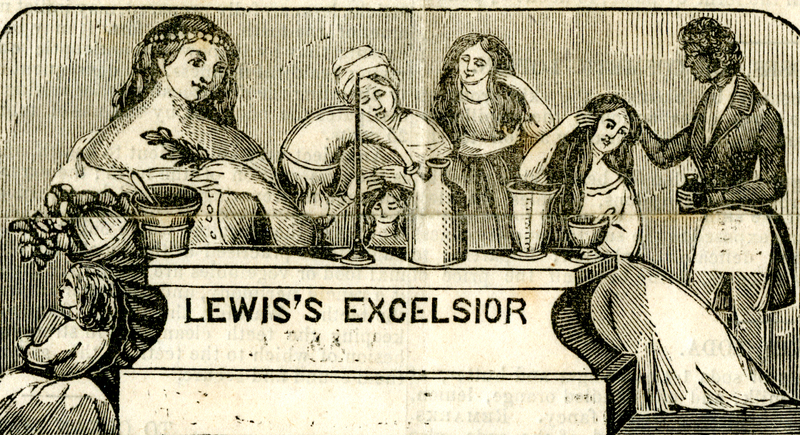 This circular advertises Lewis’ hair preparation on the recto, and products such as eau de cologne, cosmetic lotion, and Lewis’ Improved and Highly Perfumed Charcoal Tooth Paste on the verso. It is interesting to note that the hair dresser depicted in the woodengraving on the recto is African American. Does this figure represent Lewis, or an employee? 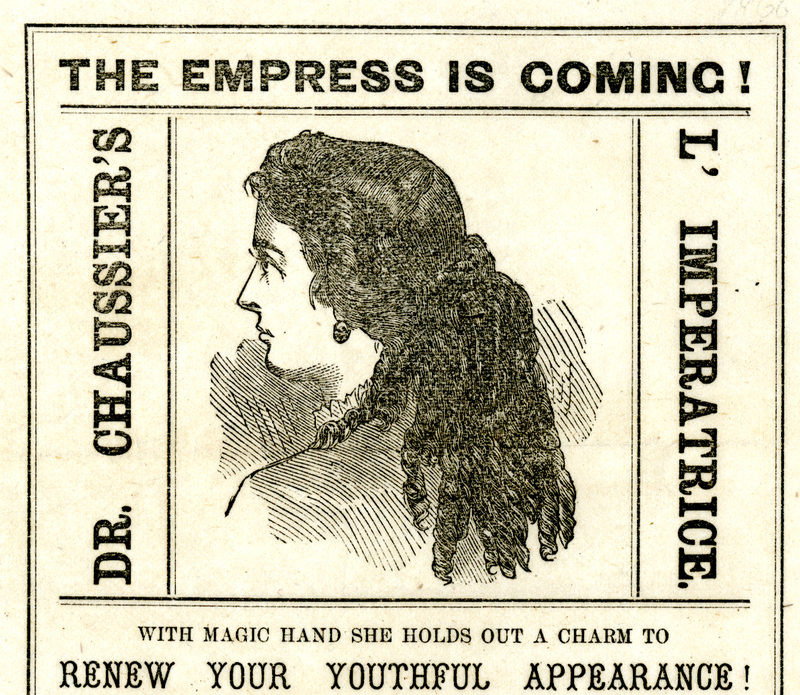 Dr. Chaussier’s L’Imperatrice, a product given a fictitious French origin and an Italian name to enhance its marketability, was manufactured by the Wallace Brothers, Manchester, N.H., in the mid-1860s. “It has long been known,” the reader of this circular is informed, “that the hair, by mental exertion, by excitement, by disease and imperfect circulation, looses its vitality, turns gray and falls off.” Dr. Chaussier’s patented preparation prevents this assault on the scalp. Directions for the product’s use are provided in French and English. This entry was posted on Monday, June 24th, 2013 at 10:43 AM and is filed under All News, History of medicine. You can follow any responses to this entry through the RSS 2.0 feed. You can leave a response, or trackback from your own site.